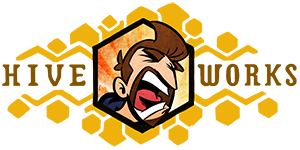 If you would like to support HijiNKS ENSUE by subscribing to premium content in The Vault, you will now get the added benefit of 15% off in the HE Store pretty much forever. I have also been throwing store discount codes up on Twitter lately. I did an interview with the TGT Webcomics Podcast which can be listened to or downloaded for your enjoyment. It was a ton of fun and good info for anyone that wants to know more about The Experiment. Thanks to Paul Westover for getting me the screencaps for reference on Panel 1 and to @theweejenny for sharing her “Team Edward” shirt pic. Posted in Uncategorized and tagged beyond thunderdome, furries, fury road, mad max, movies, scifi. I love how the creature in panel 1 looks like some kind of sports mascot. Pigkillah! !, Love this movie, hope the new one is good. LMMFAO! I can't help but howl with laughter (pun intended) at panel one. 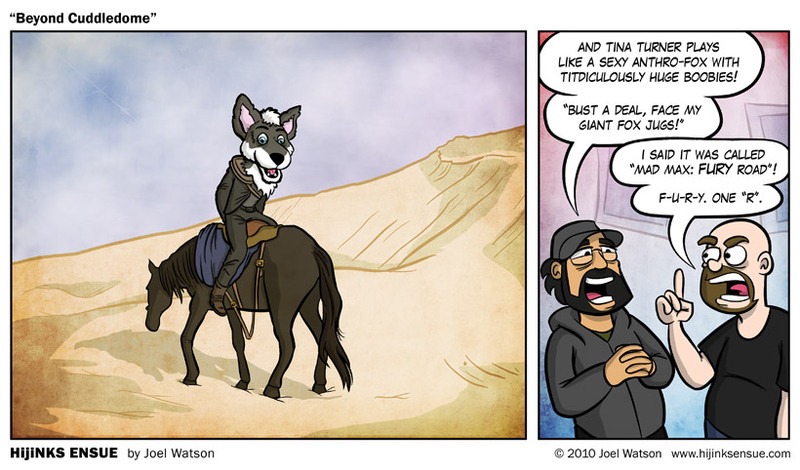 You do bad yiff costumes very well, Joel. Please tell me that this was based on an actual conversation. I love that it's Eli that's gone off into a fantasy and Josh is the one trying to impose reality. I love blissed out Joshface, but Angry Josh is just as good. stellar comic, and i think the TJTW podcast, IMHO, made the FB's remember why we love and support joel so much! It's the somewhat dazed look on the foxs' face which makes that first panel a classic. I just like the word titdiculous. If that doesn't get entered into Merriam-Webster soon I'll be disappointed. Well. I wasn't expecting THIS.